YOU ARE DIRECTLY ON THE OCEAN! Few villas can say that and none are as new as Bordo Mare, which was built in 2014. NOW WITH FULL VILLA A/C IN EVERY ROOM! 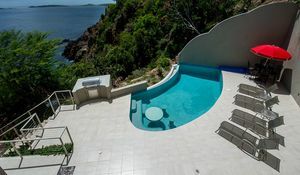 This two bedroom villa on St. John is perfect in every way. The ultimate luxury getaway. With two equally sized, king size masters facing an unobstructed view of the ocean. It is ideal for two couples to enjoy. Perfect for romance, or just to get away from daily life. The proximity to the ocean is surreal at Bordo Mare. Sometimes you feel as if you are on a ship offshore in a azure sea.